Please refer to our stock # ILC10 when inquiring. This stunning cuff bracelet is a fantastic example of the work of Maison Gripoix for the couture house of Chanel. It is 2" wide in front with a 6 1/2" end to end measurement and 1" wide gap opening. 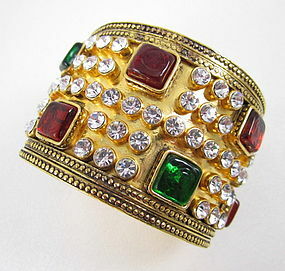 It is made from heavyweight gilt brass and has 9 Gripoix glass chiclet type stones surrounded by dozens of faceted crystals. It is in excellent condition and is signed "Chanel 2 3 Made in France" (season 23) with the Chanel logo.